To commemorate National Energy Action Month, we’re featuring some scarily effective ways to save energy at home. As cooler weather lurks around the corner, tune in to energy.gov throughout the month of October for ways to save energy and money -- and avoid cold weather terrors like energy vampires. We also put together some energy-themed pumpkin patterns to help “energize” your neighborhood for Halloween. It has long been said that on All Hallows’ Eve the boundary between the living world and dead thins, allowing spirits to run free. Ghosts and goblins roam the earth, witches take to the sky on their broomsticks and vampires rise from the dead. Whether you believe in paranormal activity or not, this Halloween don’t let your energy bill give you a scare. Defend yourself from unwanted spirits and high energy bills by sealing air leaks around windows, doors and air ducts. Before air sealing, conduct a visual inspection to detect leaks or hire a professional for a more thorough measurement of your home’s airflow. Check out more tips to stop cold air -- and spooks -- from invading your home. No need to fill your house with garlic to keep vampires at bay. Fend off these ancient creatures while saving money on lighting costs with energy-efficient light bulbs. With traditional incandescent bulbs, about 90 percent of energy used is given off as heat. By replacing 15 inefficient incandescent bulbs with energy-saving lights, you can save about $50 per year -- all while repelling vampires. Learn more about lighting choices that will save you money. There is nothing like the crackle of a fire on a cold fall day. But what can provide extra warmth during cooler months can also leave you vulnerable to higher energy bills and witches flying in your house. Keep warm air in your house -- and witches out -- with proper chimney maintenance. When not in use, be sure to close your chimney flue or use an inflatable stopper to prevent air leaks and temporarily seal the chimney. Banish goblins and other creatures lurking in the shadows with outdoor solar lighting. Easy to install, virtually maintenance free and with no added costs to your electric bill, outdoor solar lighting is popularly used in pathway lighting, wall-mounted lamps, freestanding lamp posts and security lights. According to folklore, water has magical qualities, providing protection from the undead -- ghosts can’t cross running water and the slightest drop causes witches to melt. If this is a belief you ascribe to, you can stop ghosts and witches in their tracks and achieve water savings of 25-60 percent by installing low-flow fixtures. Learn how to determine if you should replace your fixtures, and be sure your faucets are equipped with an aerator to help restrict the flow of water. Watch out for phantom loads haunting your energy bill this year. Also called energy vampires, phantom loads refer to the energy that appliances draw when they are in standby mode, and they cost the average U.S. household $100 per year. Make phantom loads disappear by unplugging electronics and battery chargers when not in use, and be sure to explore other home electronic energy-saving tips. 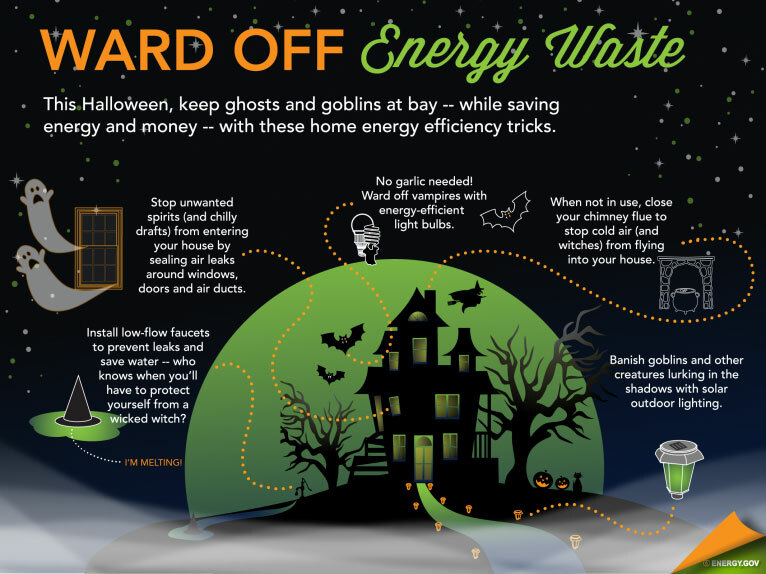 This Halloween, protect yourself from evil spirits waiting to torment you -- and rising energy bills -- with these energy efficiency tips. After all, saving energy and money is a treat you can enjoy all year long.